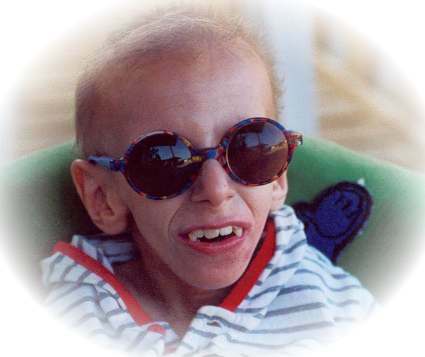 Cockayne Syndrome (CS) is a rare genetic disorder characterized by poor growth, microcephaly, progeria (premature aging), sensitivity to sunlight, moderate to profound developmental and neurological delays, and a shortened lifespan. CS is inherited in an autosomal recessive pattern. 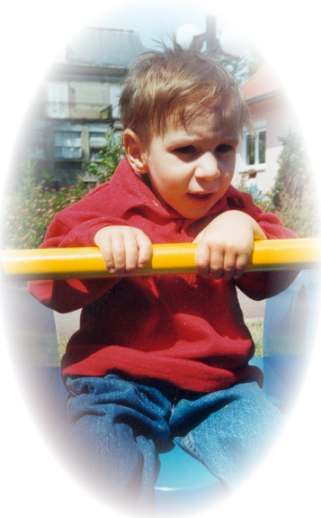 In order for a child to be affected by CS, he or she must inherit a mutation (-) in the same CS gene from both parents. The parents and other “carriers” of a single CS gene mutation remain healthy. Once a couple are known to carriers, they have a 1 in 4 (25%) chance of having another child with CS. Cockayne syndrome is listed as a rare disease by the Office of Rare Diseases (ORD). This means that Cockayne syndrome, or a subtype of Cockayne syndrome, affects less than 200,000 people in the population. The following is a list of the most common characteristics noted in reported cases of CS. No child will necessarily have all the characteristics listed, and some of these findings are progressive. Cockayne syndrome is diagnosed by clinical findings including postnatal growth failure and progressive neurologic dysfunction along with other characteristics. Diagnosis should include molecular genetic testing. •	CS type A is characterized by normal prenatal growth with the onset of growth and developmental abnormalities around one year of age. The typical lifespan is ten to twenty years of age. •	CS type B is characterized by growth failure and other abnormalities at birth, with little or no postnatal neurologic development. The typical lifespan is up to seven years. •	CS type C is characterized by a later onset, lesser symptoms, and/or a slower rate of progression.The expected lifespan is unclear, but can extent to forty or fifty years of age. Some individuals have combined features of Cockayne syndrome and Xeroderma Pigmentosum, which is characterized by a wide range of skin changes, from mild freckling to skin cancer on areas exposed to sunlight. Mutations in the ERCC6 (CSB) or ERCC8 (CSA) genes cause Cockayne syndrome. The ERCC6 and ERCC8 genes provide instructions for making two proteins, called CSB and CSA, which are involved in repairing DNA. If either gene is altered, DNA damage is not as rapidly repaired. As a result, damaged DNA accumulates, which probably leads to impaired cell functions and eventually, cell death. Increased cell death likely contributes to features of Cockayne syndrome such as growth failure and premature aging. The CSB gene product consists of 1493 amino acids and has an estimated molecular weight of 168 KDa. It contains several specific domains including an acidic domain, a glycine rich region and two putative nuclear localization signal (NLS) sequences. In addition, CSB is a member of the SWI2/SNF2-family of DNA dependent ATPases that contain seven characteristic ATPase motifs, which are also present in DNA and RNA helicases The SNF-2 like ATPase domain is critical for CSB-catalyzed ATPase activity, but the ATPase activity is differentially affected by mutations in the different domains. Thus, a motif II mutant is more affected than motif V and VI mutants, indicating that motif II is the most important one for the catalytic activity of CSB among the motifs The enzymatically active CSB protein functions as a homodimer, and the dimerization occurs through the central ATPase domain of the protein. Using scanning force microscopy for analysis of CSB-DNA complexes, it was demonstrated that DNA wraps around dimers of CSB. DNA wrapping and unwrapping may allow CSB to actively alter the DNA double helix conformation, which could influence nucleosomes and other protein-DNA interactions. A hallmark of the CS phenotype is the sensitivity to UV light. UV-light mainly leads to induction of cyclobutane pyrimidine dimers (CPD) and 6-pyrimidine-4-pyrimidone products. Normally, UV-lesions are preferentially removed from the transcribed strand of actively transcribed regions of the genome by the so-called transcription coupled repair (TCR), which is a sub-pathway of nucleotide excision repair (NER). This pathway does not function in CSB deficient cells, indicating that CSB plays an important role in TCR. TCR is initiated when elongating RNA polymerase II (RNAPII) progression is blocked by damage in the transcribed strand. RNAPII complex must be displaced and/or degraded in order for efficient repair because it shields the DNA lesion and prevents accessibility of NER proteins. CSB also appears to be implicated in other cellular processes, including transcription by RNA pol I, RNA pol II and possibly also RNA pol III. Besides the defect in coping with many types of DNA damaging agents, CSB cells have markedly reduced transcription CSB stimulates transcription by stimulating elongation of actively transcribing RNA polymerase bound to DNA and nascent RNA. Furthermore, the transcriptional response after oxidative stress is defective in CSB cells. Some of the major defects were found to be in the transcription of genes involved in DNA repair, signal transduction and ribosomal functions. CS cells display a stronger apoptotic response to DNA damaging agents than normal cells, which in part could explain why no cancer is seen in the patients. This CSB dependent apoptosis response seems independent of p53. It has also been hypothesized that oxidative DNA damage may be repaired by TCR. It is argued that the TCR deficiency of oxidative damage could be responsible for the progressive neurological disorders seen in CS patients. This area of study has been filled with controversy, but one model proposes that the TCR of oxidative damage would be due to the arrest of RNA polymerases at oxidative DNA base lesions. There is a particular class of endogenous oxidative DNA lesions that can block RNA Pol II transcription and are repaired by NER, 8,5'-cyclopurine-2'-deoxynucleosides. These lesions are not repaired by BER because of the presence of the covalent 8,5' bond. It has been suggested that the accumulation of these lesions can cause neuronal death by blocking transcription, and that this is a possible source of neurodegeneration. The observation that CSB protein is dephosphorylated at serine and/or threonine in vivo in cells which have been UV-irradiated and that dephosphorylation of CSB stimulates CSB-catalyzed ATPase activity in vitro (suggests that phosphorylation of CSB may regulate its activity in cells with DNA damage. A major theory of aging suggests that free radicals produced as a consequence of the oxidative phosphorylation processes in the mitochondria lead to damage of the mitochondrial genome. This results in dysfunction of the mitochondria and will again lead to production of more free radicals. Thus, a vicious cycle is initiated where oxidative DNA damage accumulates. The accumulation however, must necessarily depend on the efficiency of the repair mechanisms. There has been considerable discussion about whether the complex clinical phenotype of CS is due to a primary defect in DNA repair or transcription. Much data would suggest that a major defect in this disease lies in the transcriptional response to oxidative stress. This is compatible with the substantial amounts of data suggesting that progeria in CS is linked to accumulated endogenous DNA damage The observation that a defect in repair of some types of oxidative damage can be observed in whole cell, nuclear and mitochondrial extracts from CS cells, suggests that the CSB protein either plays a direct role in the repair process, or that it regulates expression, activity or localization of one of the involved repair proteins. It has not yet been determined whether CSB is present in mitochondria, and it is therefore possible that CSB plays an indirect role in the repair of oxidative damage in these organelles. CS is a very significant human disorder that has a strong premature aging phenotype. The precise functions of the CSB protein still remains unclear. The CSB protein functions in many DNA metabolic pathways and appears to have diverse significant functions in transcription, signaling, chromatin structure and DNA repair. It seems conceivable that the defective repair of oxidatively damaged DNA contributes to the CS phenotype – especially the component that has to do with the central nervous system, because of the potential association between mitochondrial dysfunction and neurodegeneration.